Can consultancy lead to leadership? 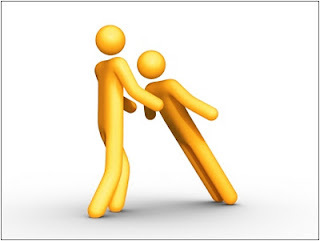 The key challenge that I envisage in transformation of a consultant into a senior manager is that professionals find it difficult to find a balance between persuasion and power respectively. This is based on the my first hand experience in the past few years. Having been in the management role for a while and then in an ivy league business school, followed by consultancy in productivity, motivation and predictability coaching to various fortune 300 organizations, I have no doubt that the answer is very subjective. 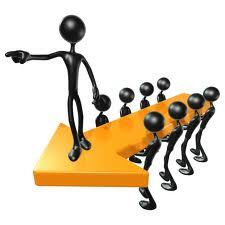 Being a consultant, the objective is to assess, strategize and persuade towards execution of strategic direction. Without power, it is a completely different ball-game. If done for too long, consultancy can lead to a innate personality change and egalitarian mindset. Management on the other hand is about maintaining the direction given by leadership and fresh pair of eyes (consultants). 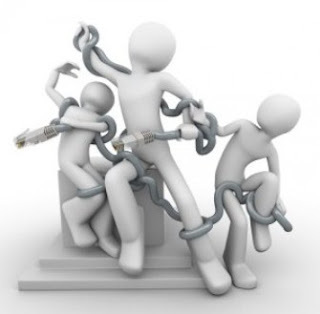 If done for too long, the mindset shifts to authoritative and power struggle starts hindering results and performance. Finding a right balance between consultancy and management could possibly result in a perfect recipe for a senior leadership role. However, it all depends on the personality type - in addition to the challenges experienced in career progression in the past. The answer to "what the right combination is? ", is - "who knows". Is the iron triangle ironic? 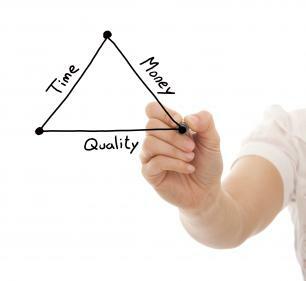 The triangle of basic business complexity based on Scope, Time and Quality has been manipulated in many ways to accommodate an ironic "Fixed Scope & Fixed Cost" paradigm in software solutions industry. On one hand, business leaders directly correlate revenue projections to software features. Hence delivering on time with committed scope and quality will provide better budget projections to the stakeholders. However, on the contrary, it is considered as an industrial norm that software is delivered late, has lower quality (than anticipated) and curtailed scope. 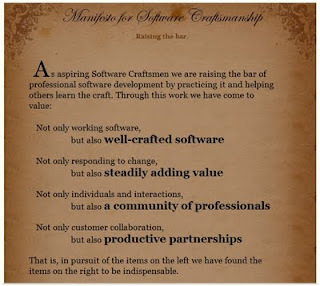 Inherent mistrust between business and software solutions department is the fundamental of current organizational realm. Having been involved in optimizing numerous organizations, i’ve been associated with large fortune 300s (ranging from 6 to 300), there is no doubt that business departments do not trust the development organizations. Denial, blame, justification and general dysfunction in such organizations is considered as a norm. The irony behind this chicken and egg situation is that without visionary leadership, the trust can never be established. In the current economic crisis, once the business stakeholders can count on the commitments, the status quo demands that they start doubting the current forecasts. This is based on the basic assumption that "how could you if you are delivering on time?". This implicitly results in over-commitment and end-user expectations are raised accordingly. Not only is this unbalanced state - a significant challenge for most organizations, but available methods for improving predictability and productivity features over time are not readily available to most technology leaders. Morphing development organizations can accurately predict their delivery in time, scope, and total quality while continuously finding ways to improve their productivity. Running continuous improvement (retrospectives) as a combined group. Start by understanding all of the stakeholders involved and how they are connected. This will help you navigate issues as you try to make change or simply do your job. When politics arise, engage parties in a transparent dialogue with each other. Organize a meeting or invite people with different views to lunch and make it safe for all by defining the casual limits. 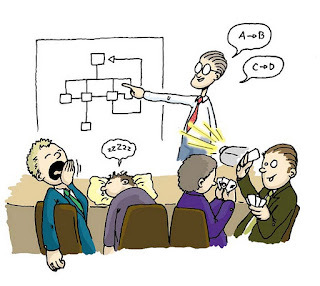 Clearly choose one of authoritative, consensus, consult or democratic methods before embarking on a group discussion. 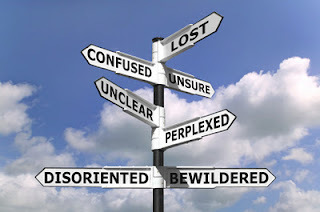 Identify the decision making process to be deployed and explain how it will be utilized according to the given context. 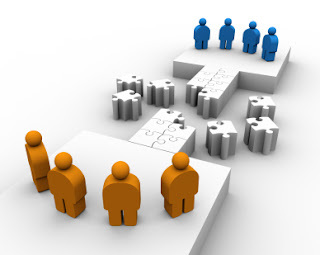 Create a plan for building alignment. Talk to people who would object and figure out how to respond to their concerns. Ask people in your camp to influence others through personal, social and structural motivation. 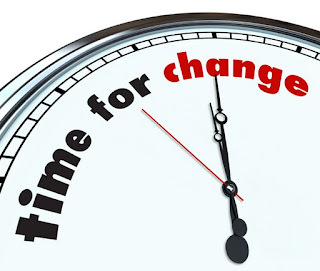 Having key stakeholders positively engaged, team members involved, decision making rules defined - you are all set to embark on an effective change initiative. By sharing the vision and following up with a road map, the change inertia can be utilized to your advantage. The question of engaging the teams affected by a change initiative is like discussing the value of oxygen in our breathing process. Change strategists in the past have either focused themselves completely for top-down approach or an exact opposite. While there is value in getting reviewed by a fresh pair of eyes and focus on outside the box questioning, there is proven higher rate of success when a contextual and balanced approach is deployed. Irrespective of the high level strategic initiatives - engagement with the reality on the ground is crucial, critical and highly effective. Especially in such instances, it is imperative to get people affected by a change to help define the problem and design a solution (e.g. brainstorming, affinity/ KJ Analysis). Once the ground reality is established, gather the appropriate and focused (narrow) metrics. 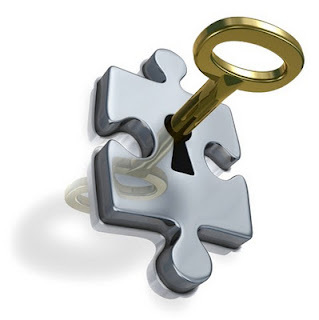 Base your change on hard data that everyone has access to and enhance multilevel transparency. Institutionalize the change by starting with a single project with a group of passionate influencers. Then move to consistently apply repeatable light weight and outcome driven objective processes across the rest of the organization. Build accountability into such processes. While combining the above three steps, create interlocking dependencies between different parts of the organization so that they have a mutual interest in sustaining the change. External forces require a company to constantly change, and a successful culture has a well disciplined methodology that allows it to do that. Joining the dots among disparate ideas is a key innovator's skill. The habit we need to develop demands careful (yet accidental) associations of complex factors of a given challenge. Think-Do cycles: Keep asking the core question of why the dots seem unrelated. Like the media and its point of view, there is another untold story in the background. We have to keenly defer our gratification by not accepting minor successes end goals. Instead - treat them as milestones towards a bigger objective. Distractions: Try to intentionally take your mind off a topic for some time and then switch back with a fresh pair of eyes. Some new potential connections might have become visible while the mind processes the information in the background. Repetition. Research shows that consistent & persistent associational thinking in complex scenarios plays a vital role in energizing rather than fatiguing. Use cycles of creative thinking with breathing spaces to allow creative juices to flow. Earlier this year - I was contributing (in a team) towards developing a strategy and agile/ lean transformation methodology for Department of Work and Pensions (DWP)'s huge programme called Universal Credit (UC). This is approximately similar in size as to the NHS integration initiative. Like the NHS, the objective of this three year programme is to combine all the disparate benefit systems. This will enable the UK Government to centralize all the key information about the recipients of welfare benefits and reduce the inefficincies due to out of synch departmental systems (especially HMRC). The overall programme is extremely complex and involves ministers, huge external suppliers, multi-site design teams etc. Change Conflict is still one of the biggest challenges on the horizon as it involves passing of welfare reform bill, input from the cabinet, the opposition and ultimately (if all went well) input from Her Majesty's think tanks. Any change during this process (which is inevitable) used to result in extra spending of millions of pounds of public money. The biggest and most critical support that our transformation strategy team got was from the top executives and extremely dedicated and passionate programme directors. It is too early to benefit from the fruits of this engagement - however, one thing is for sure; UK Govt's IT Programmes will never be the same again as they sincerely want to succeed. The methodology is now well on its way and is proving to be extremely adaptable and results oriented. Thanks to the refactorable/ test driven development - the policy level changes are actually pluggable via a rules engine and helps the Govt representatives to make informed decisions. The proud moment for all this is shown on Agile Awards 2011 for "Best Use of Agile in the Public Sector"
"Department of Work & Pensions - DWP will change the way government works forever, and there are not many projects that can make that claim. 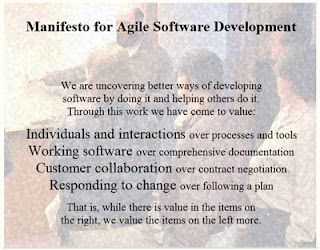 (http://www.agileawards.co.uk/Winners2011.html)"
Crux of the matter is - all is not doomed; the UK Govt is trying and trying really hard in a positive way. After all the horror stories of huge failing programmes in the past - it is the UK Govt that is really deparate to succeed. 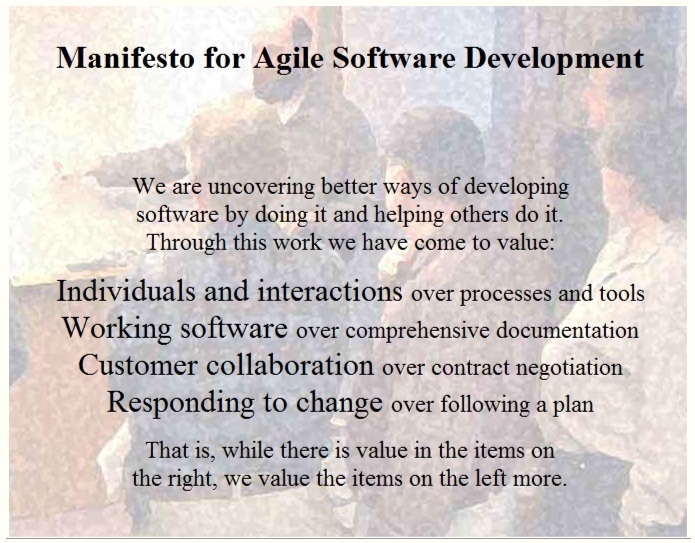 Along the way on this agile/ lean journey - the whole society would benefit. Succeeding without self-assurance is a daunting challenge; and so is the innate feeling of insecurity. and lack of skill/ knowledge. •Stop worrying - start practicing: If there's a job or task that you're worried about, practice doing it. Preparation builds both skill and confidence. Embrace new opportunities. Playing to your strengths is smart, but not if it means you don't try new things. Experiment on novel challenges - fail early and learn from the mistakes to remind yourself what you are capable of. With these simple defibrillation techniques, we can stop fretting and start performing to our true potential. 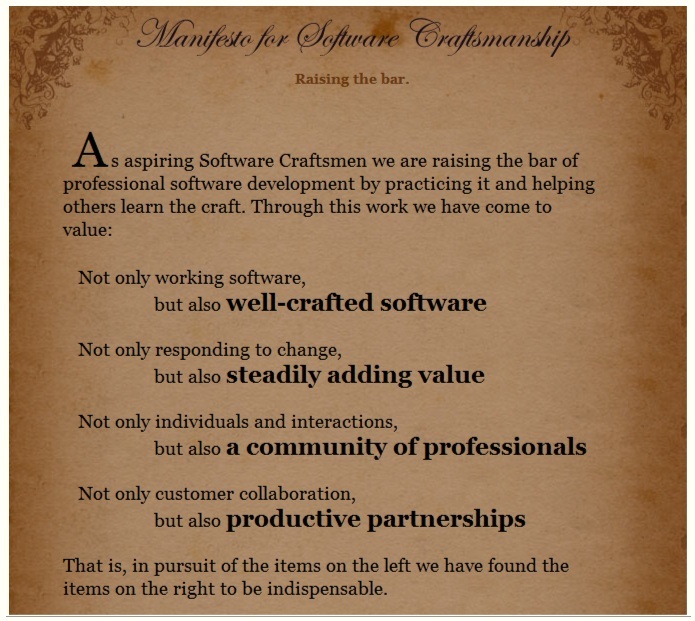 Is the 'Manifesto for Software Craftsmanship' a logical next step from 'Manifesto for Agile Software' Development?